It is now almost fifty years ago that I had a very inspirational time on a kibbutz in Israel, but it wasn't exactly the usual inspirational experience that most young people have who volunteered to work on a kibbutz. It was in the summer of 1968, I had come to Israel and part of my stay included working as a volunteer on a kibbutz. I worked in the fields harvesting bananas and peaches and I also worked in the kibbutz factory making plastic slats for window shades. In those days there was little outdoor lighting. Israel was a impoverish country then and Syria seemed to enjoy sending bombs in our direction so at night there was just enough lighting outside to be able to find your way back to the little bungalow cabin that I shared with other volunteers. One night instead of returning after the evening meal, the air was cool and fresh and pleasingly enjoyable especially after a hot day working in the fields so I decided to lay down on the lawn outside of the communal dinning hall. It was beautiful weather and when the meal in the evening finished it was quite dark outside. There were no clouds in the sky and there were only a few lights lit in the kibbutz and they were of low intensity so as I laid down on my back looking up, I had a extra-ordinarily magnificent view of the starry sky. It was truly beautiful. I was able to see the Milky Way with all of the various constellations that I knew, like the Big Dipper and Orion, many many others that I did not recognize. 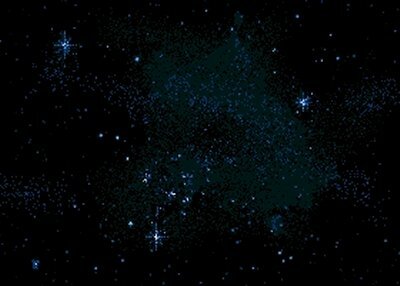 City dwellers rarely see such sights, if ever, as the view of the heavens that I saw and experienced that night. Laying there on the grassy lawn, enveloped by a pleasant cool breeze, undisturbed by peripheral lights, I began to contemplate the Universe. Where does it end? Does it end? Could it end? If it does end, what is on the other side of the end of it? Is the universe finite or is it infinite? If it is finite, what is beyond the universe? If it is infinite, how could something be infinite with no end of its length? How could it be finite? That would mean that there is an end to it and like everything that is finite and has an end, there would be something else after it or maybe there is nothing after the end of the universe? How could it be that there is an end to the universe; it just ends and nothing beyond it? If the universe is infinite, that means it extends forever in all directions; there could be no end. I really had difficulty conceptualizing something with no end. Everything in life has an end including life. If the universe has no end and is infinite in size meaning it just keeps on going, then there was a real possibility of another earth/sun relationship like ours in a very far distant galaxy, not just one such earth/sun type relationship, but if the universe is infinite, there should also be an infinite earth/sun type relationships. But how did the universe come to be? If it were finite it should have a beginning and if it has a beginning, it should have an end. There was the Big Bang theory that was popular at the time but it really did not explain much. If there was nothing but space, what exploded? What was there to explode and to make a universe of such a mass and extent? Also how did the empty space come to be? More and more the nearby lights on the kibbutz were turned off and as I lay there I began to see even more and more stars. Stars just filling the heavens in a manner that seemed to say that there were an infinite amount of stars and planets out there. How could there be such a thing as infinity? To me, space and time are all measurable entities. If space is infinite, what about time? Is time also without end or is there a beginning to time and if so there must be an end to time. It wasn't until much later in my life that I was to realize that the infinite and finite could exist together. Why? If you say that the infinite can not exist within the finite, they you limit the infinite and a limited infinite is really finite. The creation of the world had to be from the dimension of the infinite; it could not be a creation of the finite. For something finite to create the universe would require finite materials in a finite environment. But if it is the infinite that creates the finite, then there is no need to have anything since the infinite lacks no ability for if it lacks ability, it is no long the infinite, but the finite. As I lay there under the most beautiful of natures shows, I began to realize that is the reason that we Jews refer to God as the Infinite. What we use as the name of God in Hebrew really means: "was, is and will be" and all at the same time. That is a dimension of the infinite. No, I did not become an Ultra Orthodox extremist from that experience at the kibbutz, but I began to grow in appreciation of the spiritual side of life. And like I said that was almost fifty years ago, I have been involved in work and raising a family, but I could never forget my lasting experience with the Infinite, and I began to understand the secret of the identity of the God of Israel.